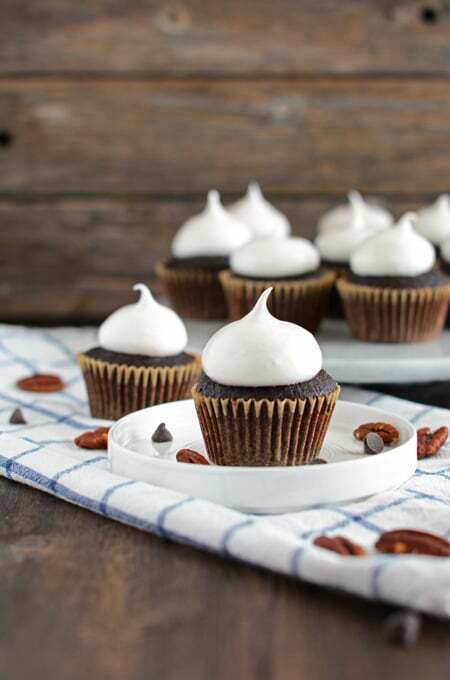 Mississippi Mud Cake is a bit of a nod to the Mississippi River. This cake is extra dark and chocolaty with toasted pecans and chocolate chips baked inside; sort of like the murky waters of the Mississippi River. 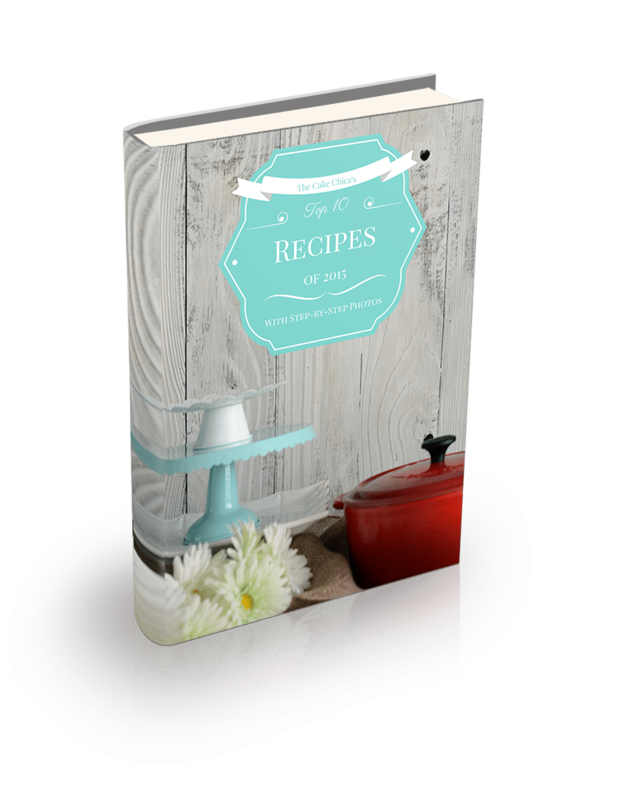 The story is that after the World War II era women were on the hunt for desserts that could be made with readily available pantry ingredients and did not require any special equipment or cooking tools. There have been so many adaptations of this indulgent dessert, from pies to cakes and brownies too! 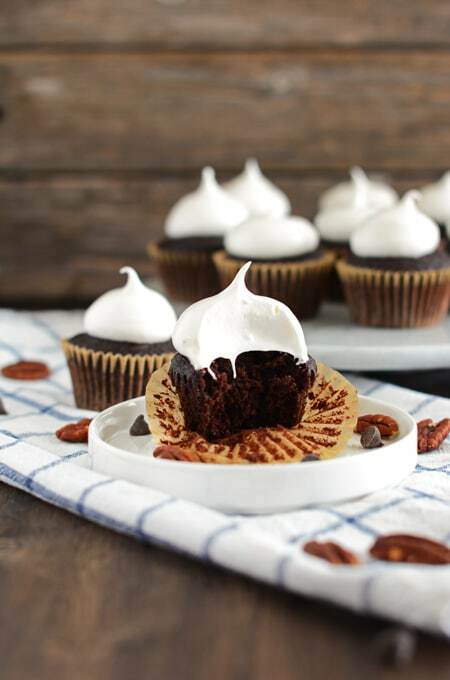 These Mississippi Mud Cupcakes will surely feed your chocolate craving! The process of making the marshmallow frosting can be a little tricky, just due to timing. 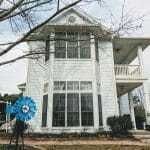 If you have a helper that would be great but not impossible to do on your own like I did. Looking for more recipes like this one? 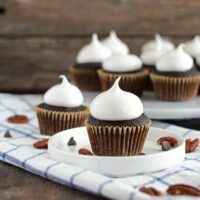 Try Chocolate Cupcakes with Caramel-Espresso Frosting Buttercream, Chocolate Cream Cupcakes and Old-Fashioned Chocolate Cupcakes with Glossy Chocolate Icing. Feel free to follow me on social media: Facebook, Instagram, Twitter, Pinterest and Yummly. Prepare 2 12-capacity cupcake pans with cupcake liners and set aside. In a small bowl, whisk the hot coffee and cocoa powder together until smooth. Set aside to cool. Sift the flour, sugar, baking powder, salt and baking soda in a large bowl and whisk to combine. Stir in the pecans and chocolate chips. In a separate bowl, whisk together the eggs, buttermilk, oil, vanilla and cooled cocoa-coffee mixture. Add the wet ingredients to the dry ingredients and stir with a rubber spatula by hand until just combined. Be sure not to over mix or the cupcakes will be unevenly domed on top. Pour the batter evenly among the prepared cupcake pans, filling each cup about three-quarters full. 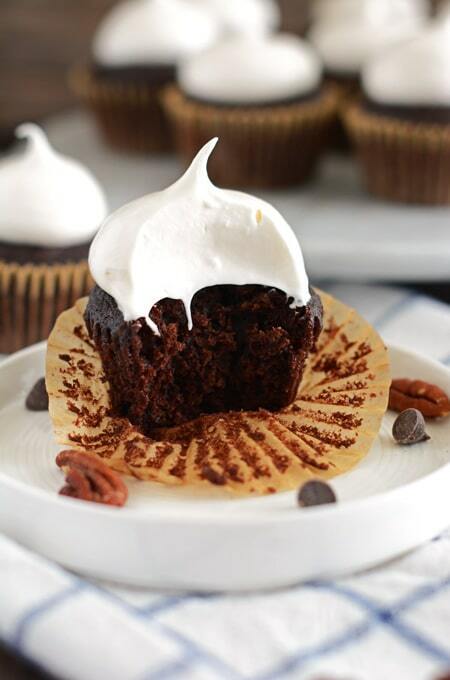 Bake cupcakes for about 15-20 minutes. Cool the cupcakes in their pan on a wire rack until cooled. Combine the sugar, cream of tartar and water in a small saucepan that has a tight fighting lid. Heat uncovered pan over medium heat. Bring the mixture to a boil, then cover and cook for 2 minutes. Covering the saucepan will help the steam will wash down the sides of the pan which will prevent sugar crystals from forming. Uncover the pan and allow the mixture to boil until the sugar syrup reaches 242 degrees on a candy thermometer. While the sugar syrup is heating, combine the egg whites with salt in a clean bowl of a stand mixer fitted with the whisk attachment and beat on low speed, gradually increasing to medium-high speed. Continue to beat the whites until soft peaks form. Carefully watch your timing at this point. If your syrup is close to reaching 242 degrees, continue to whip the whites to firm peaks. If the syrup is not warm enough yet, let the whites wait at the soft-peak stage before whipping them to firm peaks as the syrup reaches the desired temperature. Once the sugar syrup has reached 242 degrees and the egg whites are whipped to firm peaks, run the mixer on medium-high speed and begin slowly pouring the syrup down the side of the mixer bowl. Try not to let the syrup hit the whisk attachment. Continue whipping until the frosting becomes thick and holds stiff peaks, about 5 minutes. Add the vanilla extract and whip to combine. Frosting should be used immediately. Unfrosted cupcakes can be stored at room temperature sealed in an air tight container for 3 days. 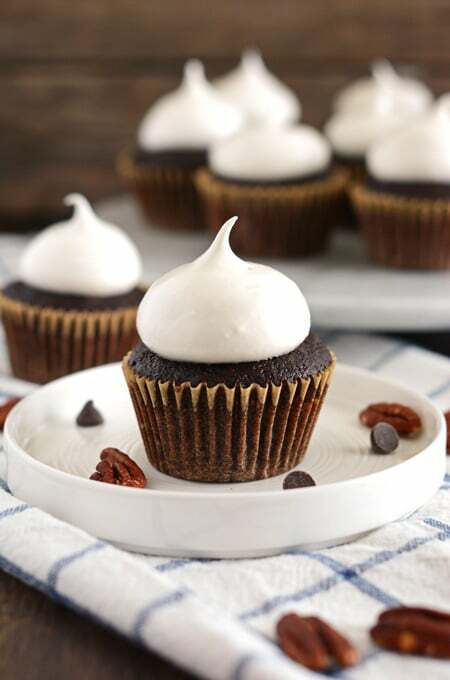 Frosted cupcakes should be consumed the same day they are frosted. 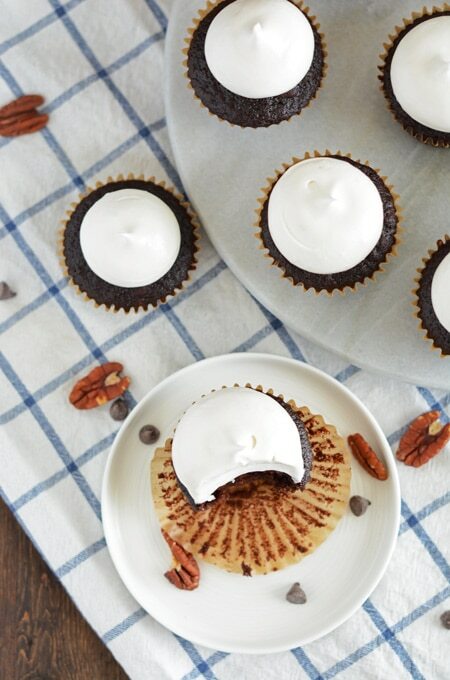 These cupcakes look so incredibly good!! 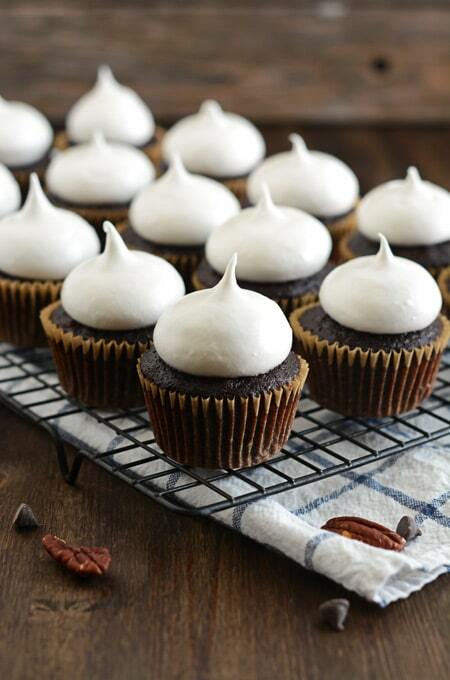 the frosting on these cupcakes is perfection!